1. 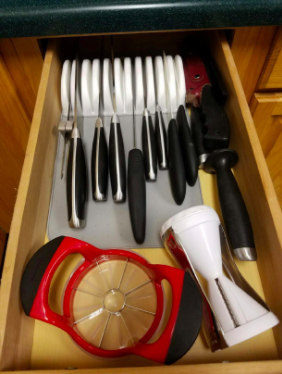 Bring an obscene amount of order to the messy wasteland where (somehow) food-storage containers end up with a lid organizer that'll blend in with your actual drawer. Holds up to 38 lids (26 small and 12 large), made of BPA-free plastic, hand-wash only, measures 11"x7.75"x3.75". 2. Corral tiny metal things thanks to a magnetic wood strip that comes in a range of wood types and lengths so it can fly under the radar. Has a continuous magnet and is made of all natural–food safe wood. Includes mounting hardware and wood plugs to cover the hardware. 3. Successfully aim when dropping your keys or fave jewelry in a drawer with this gorgeous iridescent tray — it has a slope you'll hit every time. Get it from Urban Outfitters for $14 (two finishes). 4. 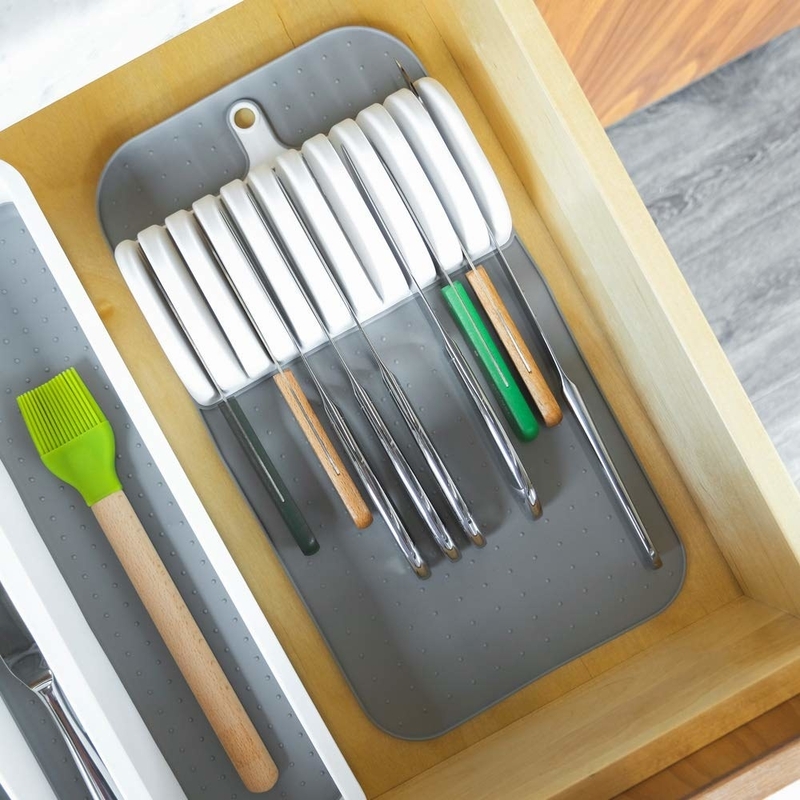 Pick up your organized drawer with you when you move over and over again with this adjustable, food-safe system that comes with a range of various notches to fit allll the things. Get it from Amazon for $34.99 (two colors). 5. Or cut a beaded shelf liner to size for a low-key transformation that'll make miscellaneous objects roll around a little less. Hey, everything helps! Get an 18"x12' roll from Amazon for $11.76 (three colors). 6. Plop in a plot of grip grass to keep loose business cards and the emergency credit card from going MIA. Get it from Bloomingdale's for $12 (available in four colors). 7. Float essentials you need first and foremost with a clear expandable tray that'll still let you see stuff in the drawer and close it as usual. Measures 12-3/4"x8-1/4x1-3/8 and expands for drawers from 11-3/4" up to 18-3/4". Promising review: "I purchased one for work. It is ideal and helps me keep everything in order in my desk. When we set up an office for me in one of our guest rooms, my 'desk' was little more than a small, basic table. My hanging files were to be stored in a storage ottoman at the end of the bed. I bought another one of these and put it over my hanging files. It's perfect! I was afraid that the part that hooks onto the frame of the drawer wouldn't fit because the ottoman is padded and upholstered. Nope! It fit perfectly. I couldn't be happier. I may get another one for my nightstand drawer. Update: I now own three of these things. (I got a new desk at work and have another drawer.) I'd buy more, but I'm out of drawers." —Sarahbeth D.
8. Transform some sheets of felt into a honeycomb organizer so your underthings can stop fighting about who gets top billing in your underwear drawer. Watch the full tutorial on Nifty here. Get a 42-pack of 8"x12" felt sheets from Amazon for $16.99. 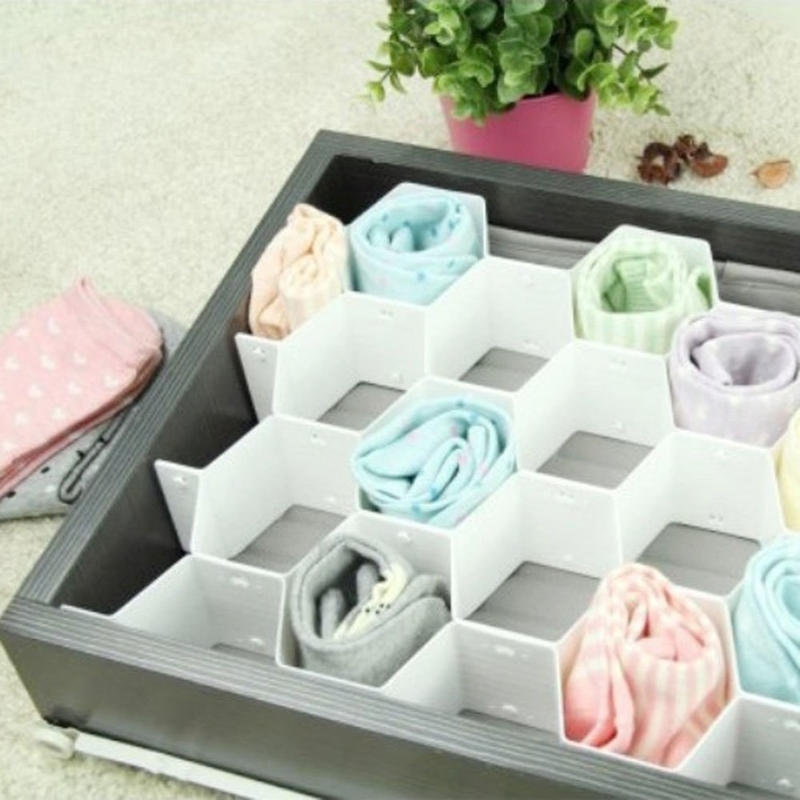 Promising review: "This thing is absolutely perfect for organizing. 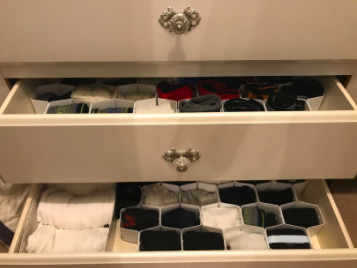 It was a GIANT mess in my husband's drawer, literally it was almost impossible to find matching socks in there because they were all mixed up with underwear. Just look at the pictures and see how nice it looks now. My husband was impressed!" —Julia R.
Get a three-pack from Amazon for $17.90. 10. Color code whose stuff is whose in the family drawer with colorful interlocking trays. Yes, that is your brother's eraser!!!! Get them from Target for $10.29. 11. Stash smaller items you'd rather other folks *not* glimpse in this pretty marble box you can nestle in with other storage containers. 12. And spotlight the stuff you're fine with others admiring in this mirrored jewelry box whose mouth is wide enough to catch earrings and other trinkets. 13. Keep noisy essentials in their rightful places thanks to a peg kit because sometimes junk drawers are HUGE and need A LOT of help. Get it from Amazon for $49.69+ (three sizes). 14. Or fashion yourself some custom dividers with this ~expandable~ peg system that'll easily fit in deep but narrow drawers. Measures 4''x17''x6'' and expands to 21.5''. Includes two bases and eight pegs. Get them from Wayfair for $25. 15. Secure loose scissors with a ~slim~ knife organizer, lest you injure yourself because you listened to Martha when she said that you need a designated set of scissors for each material you cut. 16. Lengthen your storage possibilities with a gift-like diagonal DIY made from foam board and contact paper. Check out the full DIY from Goodful here. P.S. You could use cardboard instead if you don't have any spare foam board at home. Wrapping paper can also be swapped in for contact paper! 17. Station metal odds and ends by dumping them in these magnetic trays so your loose coins and eyeglass screwdriver won't go MIA in case you turn over the trays. And keep a pair in your metal tool box drawer to keep track of tiny fasteners. 18. Tidy up the kitchen catchall with a bamboo set to put the spare keys in one spot and paperclips in another. They always seem to get tangled up together. Get them from Amazon for $16.42+ (available in two configurations). 19. Catch a glimpse of something you need (without rearranging your *newly organized* drawer) in a sectioned organizer you can bring out and toss back in as needed. 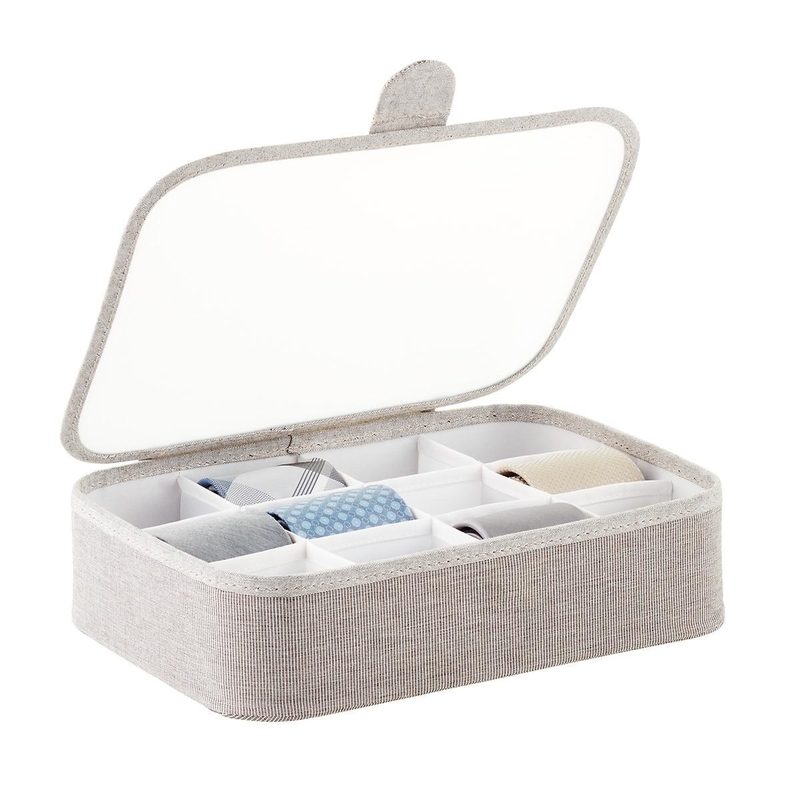 Oh hey, and this would be GREAT for staying organized as you travel. 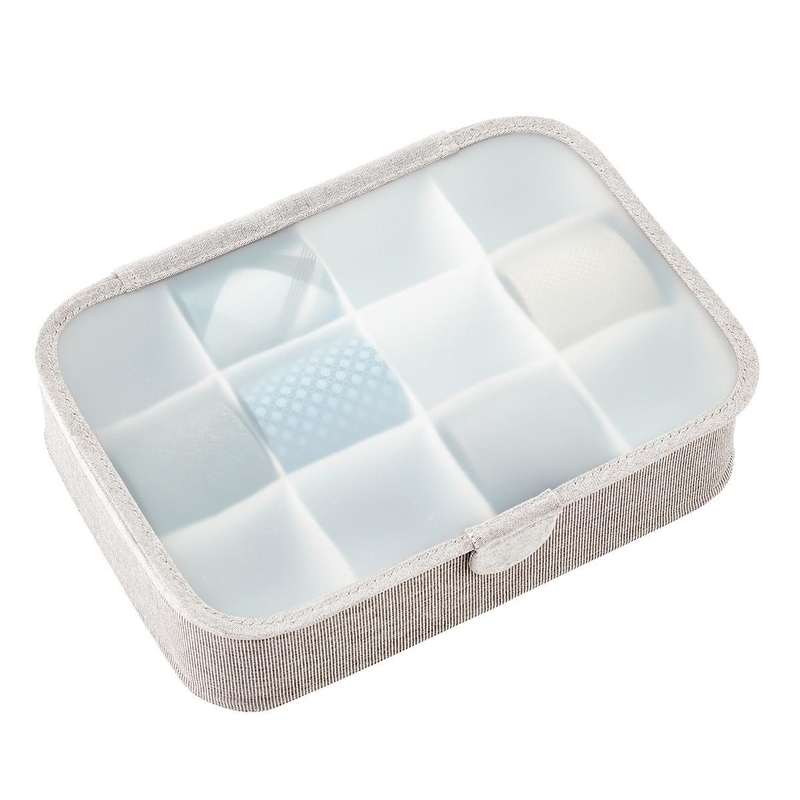 Includes three trays with 37 total compartments. 21. Put these slotted drawer organizers to task where trays and boxes just won't do. Get them from Bed Bath & Beyond for $12.99. 23. Or if all other methods fail, just divvy up each person's "junk" section with spring-loaded dividers so at least you'll know *which* pile of stuff belongs to you. Now that your junk drawers are in order, you have more time to make "cocktails." And that's a good thing.